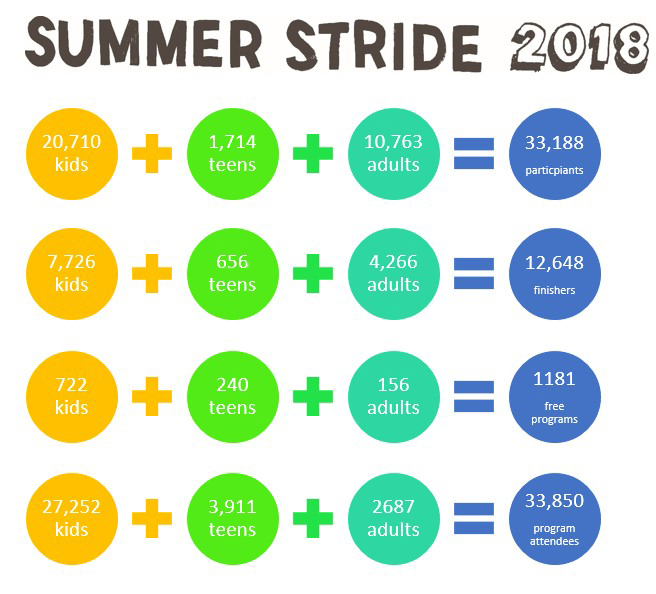 Thank you for participating in making 2018 the best Summer Stride yet! Summer Stride (YouTube) is the Library’s annual summer learning, reading and exploration program, encouraging all ages and abilities to have fun reading and learning during the summer months. The program included more than 800 programs (all free!) to deepen reading enjoyment, spark STEM (science, technology, engineering and math) passions and learn through active, outside exploration. Patrons were encouraged to pick up a tracking guide to record reading, listening and learning time, and work their way to a coveted finishing prize. Check out the 2018 San Francisco Unified School District's robust SFUSD Summer Reading List (PDF). Back by popular demand, our partner-in-fun the National Park Service provided ranger talks and free shuttles from neighborhood branch libraries to local national parks, as well as trailheads in select library locations that offer maps, directions, reading suggestions, and resources to enrich and expand your experience of visiting our area National Parks. These programs are also supported by the National Parks Conservancy and Presidio Trust. Summer learners received a special 2018 Library tote bag as their finishing prize, featuring artwork by Shawn Harris, illustrator of the new Dave Eggers picture book Her Right Foot. All ages were eligible to receive the prize after completing 20 hours of reading, listening, learning, and library time. All library visitors were invited to enter a weekly raffle at their neighborhood library location. Raffle prizes included free passes to local museums, sporting events and attractions. For a fifth year, SFPL partnered with Chronicle Books on the beautiful artwork for the Summer Stride. The artwork this year was by Shawn Harris, illustrator of the new Dave Eggers picture book Her Right Foot. We were also thrilled to partner once again with National Park Service, National Parks Conservancy and Presidio Trust. Summer Stride is funded in large part by Friends of the San Francisco Public Library, whose generous members and donors advocate, champion and invest in our premier public Library system accessible to all.